A portion of the North Tract west of the dilapidated Kings Creek marina and silted-in harbor was used years ago as a town dump. A majority of this North Tract area along with the majority of the Town was within the floodplain and portions remain in designated wetlands. The McElroy Deed contained 1,762± acres in the County, the South Tract, known as the Hollywood Farms. The McElroy Deed contained specific language: “to Brown & Root, Inc., its successors and assigns forever”. Brown & Root, Inc. purchased these combined significant properties in both the Municipality of Cape Charles and within Northampton County. Local news publications reported, and other sources stated that Brown & Root’s intent was to use the majority of the undeveloped property in the South Tract, within the County, for commercial and industrial use following an OPEC imposed oil and petrochemical embargo against the U.S. in October 1973. The Nixon administration commenced Project Independence in November 1973 to boost U.S. energy production and independence from foreign oil and energy interests. The Town approved the use of Brown & Root’s counsel to be counsel to the Town for the legal proceedings regarding the annexation petition, subsequent defense of an agreement negotiated between the Town and Brown & Root prior to the Petition submission as well as subsequent negotiations and proceedings. This combined effort resulted in a successful annexation of the Brown & Root properties identified as South Tract parcels in the County into the Town’s jurisdiction effective January 1, 1992. On March 13, 1990, Brown & Root and the Town of Cape Charles entered into an AGREEMENT. This initial agreement has been described as the “Prior (Town) Agreement” as it was amended in 1991 at the request of the Special Annexation Court empaneled by the Virginia Supreme Court, as part of the Annexation proceedings negotiations between the Town and the County with the expressed recommendations found in the Report of the Commission on Local Government Report on the Town of Cape Charles – County of Northampton Annexation Action February 1991. The original March 13, 1990 AGREEMENT specified certain future criteria, prior to the planned expansion of the Town’s jurisdiction. To petition to have the property shown in an exhibit to the AGREEMENT, annexed as a part of the Town of Cape Charles pursuant to the applicable provisions of the Code of Virginia. The “Property” as shown on the exhibit included both the then current Town corporate limits and the Proposed Annexation Area. The proposed annexation area was identified as the South Tract, known as Hollywood Farms, the current location of Bay Creek at Cape Charles’ private amenities, open to the general public such as the Palmer and Nicklas Signature golf courses, its Pro Shop, the Coach House Tavern, Bay Creek Beach Club, Bay Creek Community Pool, Bay Creek Community Beach, and only several of the planned scores of neighborhoods – villages or subdivisions located south of the historic Town. that the Town would not discriminate against any portion of the Property in the application and enforcement of any law, ordinance or regulations following annexation. the Town agreed that it would tax the Property according to Va. Code Section 15.1–1047.1, following annexation and it would provide to the Property all Town services furnished to other properties within the Town limits unless such services ‘are reduced or waived in writing by Brown & Root’. the Town agreed to fully comply with local ordinances and state statutes in the review and approval of Brown & Root’s site plans, subdivision plats, zoning applications, building and other permits associated with the use of Brown & Root’s property. the Town agreed, contingent on available natural resources, to extend water and sewer treatment capabilities to Brown & Root’s properties and to reserve for Brown & Root water and sewer treatment capabilities in sufficient capacities to service the completed development on the Brown & Root property as depicted in Exhibit B  in accordance with state regulations. the Town agreed that the provisions in ¶10 ‘shall run with the land’ and be binding upon the Town or any entity that assumes the responsibility for sewer and/or sewer treatment systems. the Town represented that it intended to fulfill its obligations in the AGREEMENT and would continue to use its best efforts to comply with all its obligations contained therein. That any sewer and water system improvements i.e. collection, distribution, treatment and lines that it is required to construct per this Agreement would-be built-in accordance with state standards. That the provisions in all of paragraph 10 ‘shall run with the land’ and be binding upon the Town or any entity that assumes the responsibility for sewer and/or water treatment services for the Brown & Root property. Thirteen (13) days after this AGREEMENT was signed, on March 26, 1990, The Town filed its Notice of Annexation Proceedings to the Commission on Local Government. A year later, February 1991 The Commission on Local Government – Commonwealth of Virginia issued its: Report on the Town of Cape Charles County of Northampton Annexation Action. As found throughout this Report there are many references and footnotes as to the interactions, correspondence, testimony and public hearings among the various interested parties. On April 30, 1991, The Town filed its Petition for Annexation Ordinance NO. 361 in the Circuit Court of Northampton County. On May 9, 1991, an Option and Purchase Agreement between Vernon and Betty Jean Martin and Brown & Root was entered for the sole purpose of purchasing land for a proposed ‘connector road’ for the PUD development South Tract as an anticipated and resulting in a provision found in the AGREEMENT that Brown & Root would construct a new access corridor from Route 184 across the Martin property. On November 1, 1991, the Town filed a Brief in Opposition to the County’s Motion to Dismiss the Annexation Suit. The Town was successful in those proceedings in defense of the March 13, 1990 AGREEMENT as enforceable and valid. Contained in the Town’s Brief in Opposition to the County’s Motion, the Town re-emphasized on page 16, the power and authority to provide a unique tax provision to Brown & Root as to maintaining assessed values of property owned by Brown & Root in the Town. Specifically, the Town stated: “Likewise, nothing precludes the Town from determining when or how often it assesses property, so long as it does so at least every 4 to 6 years.” The Town continued in the same paragraph to include: “Similarly, localities around the state may differ on when they determine property to be “improved” or “unimproved”. On November 25, 1991, The Town and Brown & Root entered into an AMENDMENT TO AGREEMENT OF MARCH 13, 1990. This Amended Agreement was a condition of the Special Annexation Court for Northampton County. This Amended Agreement was to address specific concerns, recommendations, and TERMS AND CONDITIONS OF ANNEXATION as found in the Commission’s report. Paragraph 10 of the ‘Prior Agreement’, was amended to add details as to the Town and Brown & Root’s obligation and covenant to: ‘abide by the “Proposal for Water and Waste Water Treatment Plant Improvements” submitted to the Commission and referred to by the Commission in its report on the proposed annexation by the Town of Cape Charles, dated February 1990’. The date should have read, February 1991. Also, on November 25, 1991, the Town and the County entered into an ANNEXATION AGREEMENT. These government parties acknowledged receipt of the “Report on the Town of Cape Charles-County of Northampton Annexation Action”. These parties agreed to settle the pending Annexation Suit, whereby the County withdrew its objections to the pending Annexation Suit. As a result, ¶ 5 of the AGREEMENT was no longer challenged as to the provision of the unique tax provision provided to Brown & Root, its successors or assigns. The parties urged the Commission to recommend and/or the Special Annexation Court to approve the ANNEXATION AGREEMENT. As a result of all of the negotiations and annexation proceedings, on November 26, 1991, both the Special Annexation Court for Northampton County and the Circuit Court of the County of Northampton issued The Annexation Order Law No. 27. Therefore, by a provision of the Virginia General Assembly, Public Law No. 27 was enacted as a ‘legislative act’ not subject to judicial proceedings, nor subject to any Statute of Limitations, unless specifically expressed in the Orders or by Agreement, such as the Bayshore Agreement’s ten-year tax relief. In 2000 Baymark assigned its obligations and rights under the Contract to its wholly owned corporate entity, Bay Creek, L.L.C. By ASSIGNMENT OF SALE AND PURCHASE AGREEMENT, dated February 23, 2000, recorded by deed. This assignment included reference to the obligations and rights under the Contract as they pertain to the Annexation Agreements. Bay Creek joined therein to evidence its agreement to be bound by the terms and conditions of the Contract. Baymark Construction commenced site improvement work and North Beach Restoration and Kings Creek Marina restoration projects, prior to the purchase of the parcels from Brown & Root. Baymark, and its controlled real estate company Progressive Realty marketed and advertised the North Tract parcels – The Colony and collected cash deposits for identified lots in this first North Tract subdivision. Baymark, as Developer and Declarant to the Property Owner’s Association’s Declaration, failed to post a surety bond for construction and land improvements in the North Tract. Beginning in 2002 “BAYCREEK THE COLONY” entered into Purchase Agreements for Improved Lot(s), in the North Tract. In 2004, BCMR as Baymark and Bay Creek L.L.C.’s subdivider applied for Town of Cape Charles Plat approval of 118 residential lots in the proposed Marina Village East, MVE – subdivision. Baymark and Bay Creek LLC as Developers and Declarants of Bay Creek at Cape Charles both failed to post a surety bond to complete MVE. Beginning in 2005, BCMR, as an assign of Brown & Root, through Baymark and Bay Creek is identified as Seller of lots in Marina Village East, The Colony and Kings Bay. In November 2006 Baymark, and Bay Creek through its controlled subdivider BCMR, discontinued completion of the MVE subdivision and repurposed its bank line of credit for other BCMR corporate or related corporate entity purposes. Such repurposed funds were reportedly used for other purposes but were not used to complete the Marina Village East subdivision. South Tract developments were consuming projected and Town stated, ‘limited utility capacity’. In 2006 Baymark, Bay Creek and BCMR conveyed by deed, the common areas and unfinished streets and Town approved platted infrastructure obligations to the Property Owner’s Association. Baymark, Bay Creek and BCMR were not assessed property taxes due to the County and to the Town at the time of these conveyances as required under Va. Code § 55-509.1., for planned communities. In June 2007, Baymark, Bay Creek and BCMR conveyed Parcel T to a third-party developer. Baymark and Bay Creek stated in the documents at closing of this sale, that Parcel T in the North Tract, located on Chesapeake Bay frontage, was not required to abide by the PUD Municipal Ordinance or the restrictions contained in the Property Owner’s Association’s Declaration and Supplements, all in apparent contravention of the Town’s PUD Municipal Ordinances and the Association’s Declaration, as filed in the Clerk’s Office on February 3, 2000 as Instrument #000000213. The Parcel T conveyance established the lowest sale price per acre value in the North Tract. On February 1, 2008; by published assignment from Bay Creek, the BCMR rights, duties, obligations and benefits are transferred from Bay Creek back to Baymark. On March 8, 2008, Baymark and Bay Creek sold a controlling interest in Bay Creek South, LLC a controlled entity of Baymark, to Keyser-Sinclair. Keyser-Sinclair is a controlled subsidiary of the public company Sinclair Broadcast Group Inc. No assets formerly owned by or subdivided by BCMR were a party to the sale of assets of Bay Creek South to Keyser-Sinclair. Sinclair announced in March 2008 to its public shareholders that it controls Bay Creek South, and by recorded instrument in the Clerk’s Office of Northampton County, controlled the Property Owners’ Association as Developer and Second Successor Declarant of and for the Association, which includes the PUD development North Tract subdivisions of The Colony, Kings Bay and Marina Village East, the Bay Creek Marina and related businesses located in the northern sector of the North Tract described as Marina Villages. In 2012, Bay Creek Marina, controlled by Baymark as of February 2008, and its associated businesses located in the commercial district known as Marina Villages – together with significant vacant parcels and lots, failed to repay its 2005 Marina Village East completion loan, the 2005 North Tract Breakwaters loan and defaulted on the 2006 re-purposed BCMR loan from Gateway Bank & Trust Co. The Bank foreclosed on BCMR’s pledged assets at a public auction in December 2012 to a third-party developer. This former private marina amenity to the Bay Creek development as advertised and promoted by Baymark as the Bay Creek Golf and Marina Resort along with the marina and restaurant business and rental villas are now known as the Kings Creek Marina and Oyster Farm restaurant and its associated businesses, remain part and parcel to the PUD Document restrictions, zoning requirements, land classifications, obligations and covenants established by the Annexation Agreements and therefor the Annexation Order. A direct line can be drawn from the McElroy deed to Brown and Root, Inc., to Baymark Construction, to Bay Creek, L.L.C., to Bay Creek Marina and Resort, LLC, conveyed back to Baymark, and Bay Creek South, LLC and as third-party beneficiaries, directly to and thereby subsequent purchasers of parcels and lots by title and deeds of conveyance of Town approved platted parcels and lots in and throughout the PUD development “Bay Creek at Cape Charles”, formerly known as Accawmacke Plantation. Sufficient detail and recorded documents demonstrate the assignment of rights from Brown & Root to Baymark, to Bay Creek, to BCMR, BCMR back to Baymark, and to Bay Creek South, controlled by Keyser-Sinclair, establishing the acceptance of the rights and obligations of the parties and to the Annexation Agreements and Annexation Orders. BCMR, subdivider of North Tract subdivisions was never a Declarant or Developer as defined in the Declaration and the Virginia Property Owners’ Association Act. Baymark was the original Declarant as of February 1, 2000, followed immediately by Bay Creek, March 22, 2000, and subsequently Bay Creek South/Keyser- Sinclair as Second Successor Declarant, February 28, 2008. Considerations should be given to the reasonable expectations that the failure by the Town: to enforce is own Municipal Ordinances found in the PUD Development Document; failure by the County through the lack of established and County sought oversight of the conditions it required of the Town as part of the Settlement Agreement to enact the Annexation Orders; and the subsequent failure of both governmental agencies to oversee the Town’s utility and connector road improvements, present clear evidence that neither governmental functions protected the real property taxpayers in and throughout Bay Creek or the residents of Cape Charles and by extension, the taxpayers of Northampton County. Bay Creek was all the while, promoting its subdivision expansion efforts with Bay Creek’s Real Estate marketing and sales efforts coupled with its filed and Town approved platted new subdivisions. The Town, addressing the well-known need to upgrade its aging and quality deficient wastewater treatment plant combined with the requirement to expand utilities to meet the forecast demands of Bay Creek acknowledged and addressed the reserve capacity requirements and obligations it had agreed to provide to both the North and South Tracts of the Bay Creek at Cape Charles development. Plant capacity and plant replacement became a public dispute. Bay Creek appears to have timely reduced its forecasted capacity demands and needs by apparent abandonments of the Marina Village East subdivision and by curtailing the number of condominium units in the foreclosed The Fairways Condominium, perhaps therefore artificially reducing the time pressure on the expansion of the wastewater treatment plant in 2006 as it sought a new financial partner, Keyser-Sinclair. Keyser-Sinclair in an undated correspondence from its executive Oral Lambert, to owner of lots and homes in Bay Creek publicly acknowledged Keyser-Sinclair only had a financial interest in the South Tract and therefore its interests lie only in Keyser-Sinclair’s capacity needs and demands, perhaps at the expense of the North Tract subdivision, The Colony and Marina Village East and the Kings Creek Marina district. The PUD Site Plan Ordinances enacted by the Town and following state statutes, required the streets to be paved to a standard set by the VDOT. Therefore, no legal or valid certifications of occupancy should have been issued by the Town. The streets in Marina Village East did not meet this requirement until the year 2015. The PUD Site Plan Ordinances required approved plat infrastructure development and construction to certain timetable limitation and subsequent penalties. Failure to meet those time constraints – within 5 years or the year 2009, would restrict or limit any valid or legal issuance of certificates of occupancy until such time as the Town granted new construction approval after review and or appeal and the waiver of appropriate penalties provided for in the Ordinances. Baymark would be a party to this action as a result of the February 2008 re-assignment of membership interests formerly held by BCMR, the subdivider, back to Baymark from Bay Creek to its sole member, Baymark. 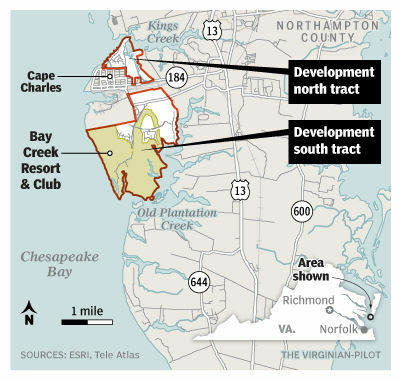 However, Bay Creek South (Keyser-Sinclair) accepted in March 2008 by recorded instrument, the acknowledgment as the Second Successor Declarant – and therefore as Developer, under Virginia’s POA Act for Bay Creek at Cape Charles Community Association, which includes all of the North Tract subdivisions. Bay Creek filed Supplements to the Declaration to include the Units in Marina Village East Phase I on January 20, 2005; May 3, 2005 the Units in Marina Village East Phase III; and May 20, 2005 the Units in Marina Village East Phase II comprising a combined total of 117 Units in Marina Village East – representing over 17% of the then total Bay Creek at Cape Charles development. As of May 20, 2005, Supplement filing, there were a total of 686 Units within Bay Creek at Cape Charles, subject to the Declaration. By December 29, 2005, Bay Creek and Baymark had filed a Supplement to the Declaration to include an additional 78 Units of condominium Units (FAIRWAYS II CONDOMINIUM) ‘to be developed in the South Tract, followed by a March 21, 2006 filing for 72 Units in FAIRWAYS III CONDOMINIUM. Subsequent parcels, Phases and additions to the number of Units subject to the Declarations followed in 2006 and 2007. Overall, 873 Town of Cape Charles approved and platted Units, subject to the Declaration and subject by Title and Deed to the PUD Document had been listed on the Bay Creek Master Plan submitted by Bay Creek and maintained in the office of the Town Planner up and until 2012. How will Keyser-Sinclair increase its shareholder values if it cannot grow and expand the South Tract previously planned subdivisions without an expanded utility plant? Especially after paying Brown & Root on May 14, 2014, the remaining amount of $8,147,545.62 from the original installment sale Contract for the remaining tax assessed parcels in the South Tract containing planned but unused residential 1,983 Units? AGREEMENT dated March 13, 1990, between the Town of Cape Charles Virginia and Brown & Root I, Inc., amended November 25, 1991 AMENDMENT TO AGREEMENT OF MARCH 13, 1990. Exhibit B Accawmacke Plantation Plan of Development: Accawmacke Plantation consists of approximately 2000 acres owned by Brown & Root. The property will be developed as a resort-recreational, second home and retirement community consisting of a total of 3000 units. The units will consist of a variety of housing types to accommodate the diverse needs of the residents, etc. This would all be a non-issue, had the CBBT never been built.